The extraordinary KX7 is packed full of features for complete control of entertainment, environment and security systems in any residential or commercial installation. The wall-mounted touchpanel has a slim profile, framing a control interface that can be custom tailored for every installation. Taking the user experience to a new level, the vivid 7” LCD touch screen even allows screen swiping for page navigation. Meanwhile dealers will love the powerful capabilities at their disposal, such as the built-in infrared communication capability, allowing for direct control of electronics without a control processor. In addition, video inputs make it possible to view analog video while an Ethernet connection enables even more functionality, such as viewing IP security cameras, surfing the web and advanced twoway control. From the kitchen countertop to the conference room, the hardwired CX7 is perfect wherever “always on”, intuitive control is required. The 7” LCD touchpanel has adjustable tilt, allowing the display to be angled straight up to nearly flat. The CX7 can even be mounted inverted under a cabinet. Additional features include wired and wireless Ethernet for two-way control, digital video (motion JPEG) and web browsing, while analog audio/video inputs and stereo speakers provide video viewing from sources such as satellite TV or security cameras. 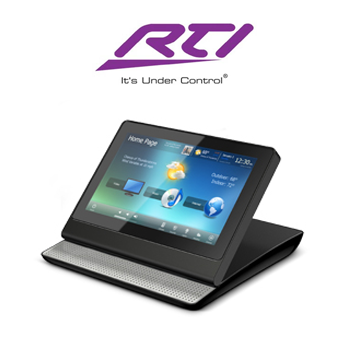 The RK3-V provides elegant and intuitive control of today’s entertainment, environment and security systems. 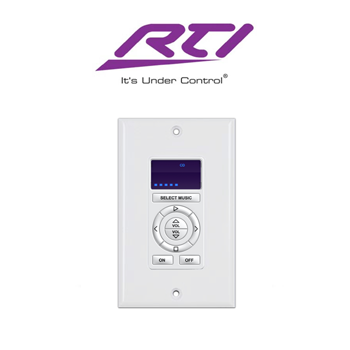 Representing the second generation of the award-winning RK-3 In-wall Controller, the RK3-V is capable of displaying text and graphics with incredibly rich and vivid detail with a new full VGA display. 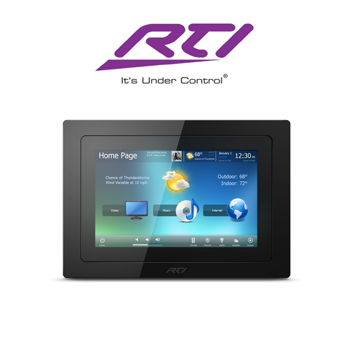 Designed for flush-mount installations in walls or cabinets the RK3-V is the only compact in-wall touchpanel that provides both direct infrared control and 10/100Base-T Ethernet for displaying digital video (motion JPEG) and web pages – either full screen or in an adjustable window. 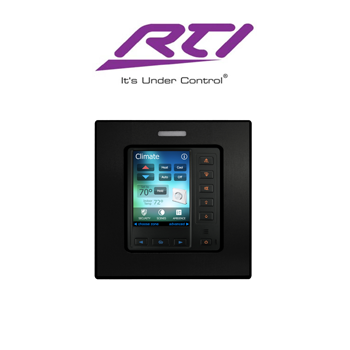 In any situation, from simple to complex, the RK3-V provides the perfect level of control. 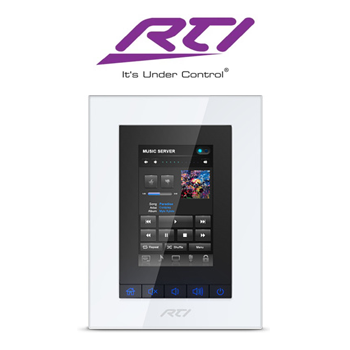 The KX2 in-wall controller has a clean, sleek design with twelve programmable hard buttons and a 2.8” color touchscreen. 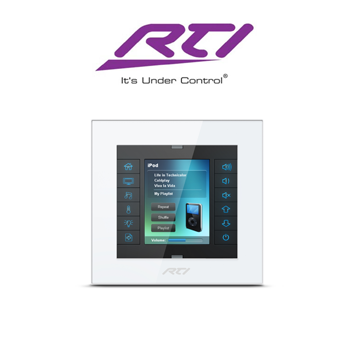 The hard buttons and graphic interface are fully programmable using RTI’s Integration Designer® software for full control of electronics throughout the building. A built-in infrared output port allows direct control or get two-way control when used with an RTI XP series control processor. In addition, the unit’s integrated 10/100Base-T Ethernet port with Power-over-Ethernet (POE) provides the flexibility to accommodate any installation. 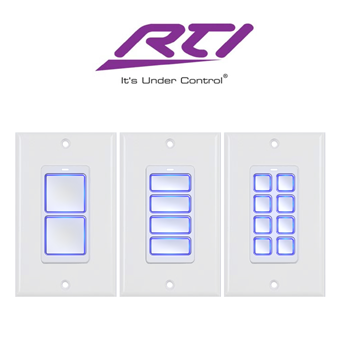 The RKM-1 is a simple, intuitive keypad designed for flush-mount installations in walls or cabinets. Designed for multi-room audio control, the RKM-1’s open architecture provides the flexibility to control almost any multi-zone receiver or distributed audio system. Sized for a single gang electrical box, the RKM-1 incorporates eight fully-programmable hard buttons and a customizable LED film which provides feedback of power status, selected source, and volume level. Our mission is to provide our clients with the highest quality products the AV industry has to offer, combined with flawless installation services and a customer service experience that results in a relationship that lasts for years. © Copyright 2013 FX Pros, LLC. All Rights Reserved.